I guess I should cut those reluctant to lower their tires down to sand pressure a little slack. My first time onto the beach in San Felipe, Baja, I did the air pressure trick, with a little unwillingness, and wasn’t sure it was really necessary. Then, over the next three or four years, I would first tackle the mellow white stuff at full street pressure and when all my power, skill and finesse failed, I would let ‘em down and move ‘em out. Me, low range and low gear, would struggle along at a whole five MPH. Deflation they defied resistance as I sailed along in high range, OD, at whatever speed I chose! Time and again, year after year, I tested the softies with the same undeniable results. Low tire pressure just plain works in the sand! Optimum sand tire pressure is a combination of many things, of which old husband's tales are least productive. However, your tires, their construction methods and materials, what your car weighs, how it is loaded, and wheel width all play into the sand-pressure tire formula with predictable results. For this article, I will neglect tire temperature which I suppose could be critical if you test below freezing and play at +80°. Why low pressure works and how to determine your best sand pressure follows. It’s a simple fact, which some diehards still deny, the bigger the footprint, the softer the stuff you can travel. Mother Nature knows it. Take a look at the feet of camels, polar bears and marsh birds. They are big and spread out to distribute their weight over a larger surface area. For those who say skinny, hard tires are better for snow, mud or whatever, please tell me why they don’t use ten-speed bicycle-type tires on snowmobiles? Sand rail people and mud boggers know big feet work better too! With that out of the way, lets take a look at tire pressure and footprints. Right next to your wheel, on the tire, find the small black print that specifies maximum load pressure. For example, my BFGoodrich Radial All-Terrain T/A 30x9.50R15LTs state 1990 pounds at 50 pounds per square inch (PSI) cold. Most folks, generally including those who install tires, run them up close to this, and neglect the actual term, "MAX. LOAD" pressure. The street pressure, TREAD FOOTPRINT figure below represents Coyote assessed over inflation. 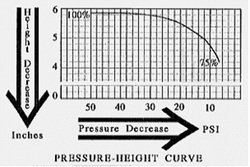 Do you really need maximum load pressure? Consider that standing flat and level (static), loaded the way you normally run is one thing. Now further consider you lose full tread width contact as the 4X cruises at higher and higher speeds. Centrifugal force tries to increase the diameter of the tread. You only have to look at dragster tires when they light 'em up to convince yourself of this tire reality. The sidewalls tend to hold the outer edges closer to their static diameter than the center of the tread and hence the center of the tread spins into an ever increasing diameter with increased speed. In other words, while moving at highway speeds, the tire is trying to run more on the center of the tread than the edge. That’s why I feel my full width, static contact test (described below) is conservative. My tire life and wear pattern prove putting more rubber on the ground increases longevity. Since this article deals with sand tire pressure, see a back issue of Ecological 4-Wheeling for full details on how to safely determine your exact, full tread width contact, street pressure. Summarizing Tire Pressure, April, 1990 4-Wheeling, you don’t want to overheat the tire and should only be able to slip a business card under the outside and inside edges of the tread less than 1/4 inch. Reprints of past 4-Wheeling articles available for $4.00 each. Follow along with some arithmetic that scopes in the same results. Four tires times 2000 pounds each (1990 MAX. LOAD rounded up to simplify math) equals 8000 pounds total (tire) load capacity. My Explorer weighs 4000 (3800 rounded up), or half the maximum capacity of all four tires combined. That roughly says half the pressure should yield ample load capacity. As a result of both methods above, I run 26 PSI, night and day, seven days a week, and typically get 60,000 to 80,000 miles out of a set of BFG T/As, including sand runs at much lower pressure. I trust this information will add practicality to determining your street pressure and encourage you to accept overall lower tire pressure. No figure is shown for the increase in street pressure footprint, but it should approach full tread width. To determine your optimum sand pressure, perform the following test on a flat, level and smooth surface, fully loaded as you would be for a sand run (gas tank and passengers included). Measure the vertical height to the bottom of the wheel (rim) from the ground. This is your 100%, street pressure, wheel height. Now reduce this height by 25%. In other words, let out air until your wheel is 75% of the street height. Measure and record this pressure and depending on your vehicle and loading scheme, front and rear tires may differ. This is your optimum sand pressure. As the TREAD FOOTPRINT figure shows, this typically results in more than a 250% increase. That is like having ten tires where you only had four. This pressure is only valid for exactly what you tested. Change vehicle, tires, wheels or load and you have to retest. It’s obvious a vehicle change would dictate retesting. Tires differ in number and stiffness of sidewall plys and rubber compounds, hence the need to retest with a tire change, and in actuality, tire age/wear too. Wider or narrower wheels influence how the sidewalls bulge, so this too requires doing the deed anew. How did I measure the 250% increase? I measured the pressure, painted the tread, let the tire down onto a piece of paper and “printed” the footprint for various air pressures. I could see the edge begin to make contact and footprint increase with ever-decreasing pressure. The results are dramatic, but carefully observe the PRESSURE-HEIGHT CURVE, and understand this is not a universally applicable curve. It is specific to my 4X, tires, wheels and load. Wheel height and footprint are obviously related. Putting the curve into words, the footprint really starts to increase (wheel height decrease) with the last few drops in PSI. Note I measured no height change from 50 to 37 PSI. From 50 to 20 PSI resulted in only 3/8 inch drop in height. The drop from 20 to 12 PSI was about 1/2 inch and the drop from 12 to 7 PSI yielded more than 3/4 inch drop in height. These last few pounds are where the real effect takes place. Give them pudgy cheeks! I’ve had people tell me the low pressure trick does not work. "I went down to 16 or 18 PSI and still had trouble in the sand," so the claim goes. It should be apparent from the curve, the last few pounds really count! A good indicator other than ease of movement comes by watching your engine temperature gauge. If you are heating up, your pressure is still too high or you’re really in some tough stuff! So does this mean flat tires are best? I believe not. Again the 75% rule is somewhat tire and wheel dependent, but at too low tire pressure, the center of the footprint begins to well up, reducing the footprint and creating a small “traveling hill” in the center of the footprint. This hill offers increased resistance to vehicle movement. For my combination of 4X, tires, etcetera, my optimum sand pressure is six to seven PSI and I typically get by with eight to ten. Before we move on, let's talk pressure measurement - tire gauges. I’ll leave the type - stick, dial or digital - up to you and a future article in 4-Wheeling. What I’m primarily addressing is the Great American Big Numbers Misconception; the bigger the number, the better it is. As a kid, I remember one of my first automotive questions was, "What does the speedometer go up to?" Not how fast does the car go, but how big is the number at the end. This end number on both speedometers and pressure gauges has little, and sometimes a negative bearing, on gauge usefulness. Actually, I have quite a few tire gauges. Several fell prey to the Great Numbers Misconception. I carry and use two. One for everyday street use and another for low pressure. My street pressure gauge goes to 50 PSI and my low pressure gauge goes to 20. It’s pretty hard to measure 10 PSI on a gauge that starts at 20 PSI. Most 120 to 200 PSI gauges don’t even start until 20 or more. These are useless for sand pressure measurements. Don’t waste your money on high pressure gauges! Consider having two and perform the above tests and field air-down measurements with the same low pressure gauge. The exact accuracy of the reading or value is not as important as repeatability. And something to plan for is the eventuality of no gauge or a failure. This is easily handled by knowing how long it takes to air down from street to sand pressure. I use the one-thousand-one, one-thousand-two, second counting method. I can let 50 seconds worth of air out of my tires before I need to take a reading. It’s usually another ten more seconds before I reach my optimum. Given a gauge failure, I will still stand a fair chance at "bringing ‘em back alive" - me, the car and the tires. Low tire pressure changes four things: footprint; ground clearance; rolling radius and what I call Obstacle Rolling Resistance. Footprint was covered above. Common sense and the TREAD FOOTPRINT figure shows the center of the axle is lowered by the decrease in wheel height. This results in lower ground clearance and consider the softer tires also flex and give more resulting in compression loss of ground clearance too. But on the other hand, ground clearance is not that important in the sand. Rolling radius is part of the equation which contributes to your net moving force; your overall gear ratio; your "stump pullin’ power". See December 1988, Ecological 4-Wheeling, for a complete treatment of net moving force. Think of it this way: you know how bigger tires eat up low gearing and smaller tires effectively give you lower gears? Flatter tires act like smaller tires and increase your pulling (moving) power. Move on to the OBSTACLE ROLLING RESISTANCE figure below to learn how significant this sleeper is! Several years back, I was convinced a tire’s ability to conform to obstacles played a big part in ease of movement, but I had no idea how significant it was until I measured it. Here’s my experiment. Face-off two 4Xs some 30 feet apart, on a flat, smooth surface. Take the winch of one and connect it to the other, with a dynamometer (a big fish scale) in the cable. Put a pair of 2X4 wood blocks in front of the pulled vehicle and measure the force (pull) required for different towed vehicle tire pressures. A simple, lowly 2X4 offers more of a climb angle (hill) than you might initially think. It is roughly 25° to 30°. Knowing this, it’s now easy to see why not so big rocks require the thrash and bash technique to climb with hard tires. The 2X4 tests showed a 40% difference between street and sand pressure! And it may be worse than that because the initial burst of pull required to get the street pressure tires started up over the obstacles (the 2X4s) was not precisely recordable with my crude equipment and test methods. With the sand tire-pressure, it was obvious the dynamometer saw a gradual buildup in force as the tires smoothly conformed and crawled over the obstacles. What this 40% difference means is you now have roughly six tires where you only had four. Add this to the "ten tires" of the pressure drop and you now have 16 where you had four. Any more questions about the effectiveness of lowering tire pressure? There is a lot more to making this test perfect and I would be most happy to redo it using proper equipment and controls. Anyone have access to strain gauge cells and strip chart recorders? Actually, I suspect this is also why lower tire pressure is very effective for rock crawling. The Obstacle Rolling Resistance factor, as I call it, plays an even more crucial role when rolling through the rocks. Now comes the soap box. Use Caution! Caution! Caution! with low tire pressure. The Obstacle Rolling Resistance factor works against you with speed and in the rocks! Soft tires easily bend and break wheels. Drive with caution when back on hard ground or the rocks! And you obviously need some way to reinflate the tires back to street pressure when you hit the black stuff. You 2-wheelers take note as well, for this trick works equally well in 2WD. But remember, you must still deflate all four tires even though you are only putting power to two. Your hard front tires create hills that your rears must continually try to climb. I also feel lower pressure is more ecologically compatible. With better traction you don’t have to spin the tires and hence leave Mother Nature unscathed. You’ll be doing yourself and Mother Nature a favor when you lower your tire pressure the next time you hit the soft stuff.